Le Geai Bleu (The Blue Jay) is located in the heart of Mont-Tremblant in the beautiful region of the Laurentians, the chalet is conveniently located close to all activities. Depending on the season you can ski to the station of the Mont-Tremblant, Mont Blanc, from cross country skiing to the Domaine St-Bernard, the numerous golf courses golf or simply play a game of shopping less than five minutes in the picturesque town of St-Jovite. 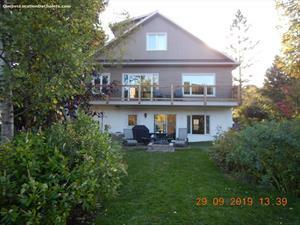 This charming country house close to Lake Duhamel can accommodate properly two or four people maximum. It consists of a bedroom with a double bed and sofa-double bed at the salon, and bedding is provided. For your culinary enjoyment, the kitchen includes all appliances such as a stove, refrigerator, microwave, toaster and coffee maker. A BBQ is also available on the outside. For moviegoers, a television with a DVD and a Super screen included programming satellite antenna. 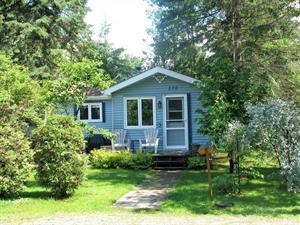 Access to the Lake for swimming in the summer or cross country skiing and snowshoeing winter. The rental includes: bed linen, towels and hand towels. Prices are in Canadian dollars and exclude applicable tax. Prices and conditions may change without warning. Reservations made less than 30 days prior to the arrival date must be paid in full at the time of the reservation. 30 days prior to arrival: The deposit is non-refundable, unless the cottage is rented for the same period to another renter, in which case the deposit will be refunded less a cancellation fee of $50cdn. Less than 30 days to arrival: The deposit is non-refundable. No reduction or refund for late arrivals or early departures.